(Rick Egan | The Salt Lake Tribune) West Valley City has just become "minority majority," where minorities outnumber whites, according to new census data. Areas like Little Saigon has shops featuring food from Mexican, Peruvian, Vietnamese and Africa. Wednesday, Sept. 12, 2018. West Valley City • Councilman Jake Fitisemanu, a Polynesian, is part of a new majority in his city. Demographers say new U.S. census estimates released Thursday allow them to proclaim with confidence that West Valley City is the first large Utah city to be “minority majority,” where minorities combine to make up a majority of the population. Minorities now make up 51.4 percent of its population of 136,166 people, while whites now account for 48.6 percent. “It’s not a surprise. Having grown up on the west side, it’s no secret to me that [minority] growth is occurring,” said Fitisemanu, who was born in New Zealand to a Samoan father and Hawaiian mother (who had Korean and Chinese ancestry). He’s lived on the west side since he was 8 years old. He and Tom Huynh, a former Vietnamese refugee who ran twice unsuccessfully for mayor, are the two (former) minorities on the seven-member city council. Despite the new status, Fitisemanu says minority groups will always feel outnumbered. “The term ‘minority’ is a term of convenience. There is actually a lot of diversity within the groups of minorities,” so each small subset feels like it is not truly part of the majority. By far the largest group among them is the 49,860 Latinos living in West Valley City, or 36.5 percent of its total population. West Valley City’s Latino population is larger than Salt Lake City’s, where 41,707 Hispanics live. Among other minority groups in West Valley City are 6,997 Asians, 4,128 blacks, 3,721 Pacific islanders, 192 American Indians and 5,381 people who say they have two or more races, new census estimates say. But the city may be diverse in more ways than even those figures show. Andrew Wallentine, director of West Valley City’s Division of Arts and Culture, lists a few of the various nationalities and groups that have recently held events at the city’s Cultural Celebration Center. “Many Latino countries use it,” he says, noting each has separate holidays and cultural events. “We have quite a few from the Middle East,” and he adds India, China, Vietnam, the Philippines, and “a fair amount of Middle Eastern countries.” It even had a large celebration recently for Jews. 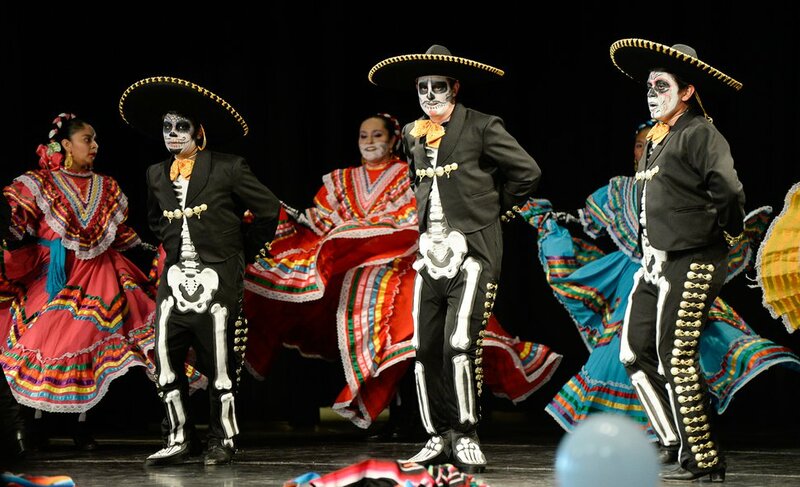 Francisco Kjolseth | The Salt Lake Tribune Ballet Folklorico de las Americas performs for the 12th Annual Day of the Dead celebration and altar exhibition at the Utah Cultural Celebration Center in West Valley City on Sunday, Nov. 1, 2015. Una Mano Amiga constructed a central altar, surrounded by many community altars and Dia de Los Muertos themed vignettes, creating a colorful, creative, and informative exhibition. Authentic Mexican food, music, dance, ceremonies, games, vendors, activities, and art stations were also part of the November 1 celebration. Mayor Ron Bigelow says he believes minorities and immigrants are attracted to the city for several reasons. “One, we have a bigger inventory of less costly homes,” and immigrants especially may not have a lot of money, he said. “Second, there is already a good [minority] population here and people feel comfortable moving in” to be be near others who are like them. He said that includes building the Cultural Celebration Center to host shows, weddings and a variety of events for the many cultures. It welcomes businesses that cater to a variety of cultures. “We have certainly encouraged ethnic restaurants. There have even been some developers come in who have created strip malls and shopping areas of ethnic foods and grocery stores,” he said. An example is the Little Saigon Plaza on 3500 South at about 1900 West. It has Mexican restaurants, a Peruvian restaurant, a Hawaiian restaurant, Latino furniture and candy stores and a Latino grocery store. Across the street, a Vietnamese doctor has a large sign for his office. Pam Perlich, director of demographic research at the University of Utah’s Kem C. Gardner Policy Institute, notes that West Valley City barely inched into minority-majority status with data released last year — but demographers were unsure if it was a temporary blip possibly due to sampling error. This is the second year of such findings, and data shows continuing growth of minorities — so Perlich said she now feels comfortable proclaiming it a majority-minority city. A few smaller towns — mostly on Indian reservations — have previously had that status, but none nearly as large as West Valley City, the second most populous city in the state behind Salt Lake City. Perlich said trends suggest that more cities will also become minority majority in coming years. “West Valley City is a bellweather for what is coming,” she said. She notes that census data show that foreign immigrants continue to arrive, but most are now coming from Asia instead of Latin America. Utah’s foreign-born population last year grew from 252,333 to 269,239 — an increase of nearly 17,000 people, or roughly the population of San Juan County. People moving from other states are also increasingly diverse. And immigrants living in the state tend to have larger families — adding to those groups. Perlich — and Fitisemanu — are worried that the upcoming 2020 census may not capture all of West Valley City’s immigrants and ethnic groups because some may fear that answering new questions about citizenship could lead to deportation. Census estimates say about 39 percent of the the city’s foreign-born population are naturalized U.S. citizens, Perlich says, lower than the 49 percent average nationally. “As you look at a city like West Valley, it is way exposed to an undercount,” she said. Fitisemanu says the city realizes that — and that an undercount could bring a loss of federal funding that is based on population reported by the census. Salt Lake City already has decided to hire a census coordinator to ensure hard-to-count populations are not missed in the 2020 count.